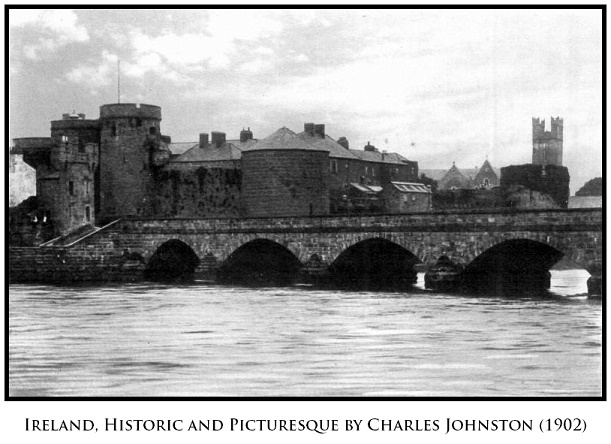 The original Thomond bridge would possibly have been erected about 1185 as a lead from Limerick Castle to the Clare side of the Shannon River. It has been rebuilt several times over the centuries. It is on the site of the oldest bridge in Limerick city, and was once the only bridge across the Shannon. The bridge of the 18th and early 19th century had fourteen arches. The bridge is the scene for Limerick’s tales from the Bard of Thomond, including “The Bishop’s Lady” who the story tells us would toss late walkers over the bridge to be taken by the river. The bridge that stands today was completed in 1840, it was designed by the Pain Brothers, who designed many buildings in Limerick during this period, including the County Courthouse, the Custom House. There is a benchmark in the centre of Thomond Bridge.